In May 2005 Caroline South's Keith Hampshire visited the UK from his home in Canada. He contacted a few of his former ship-mates and, as five of them were celebrating their sixtieth birthdays during the course of the year, a celebration was called for. Unfortunately one of them, Roger Day, was on the air at the time so was only able to join them by telephone. 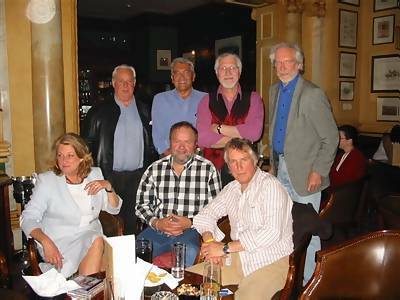 The other four met up in a London hotel on 23rd May 2005. Many thanks to Duncan Johnson for the photographs. Looking good, despite the combined age of 240! 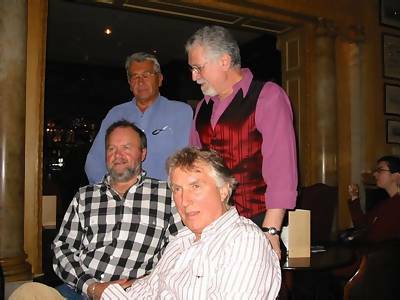 Back row, left to right: Tom Edwards, Dave Lee Travis, front: Keith Hampshire and Johnnie Walker. 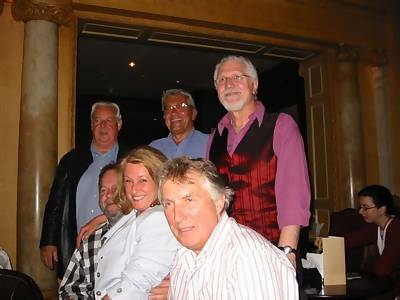 The same four plus newsman Mark Sloane and Carolyn Bristow (née Irvine), who worked in Caroline House during the sixties. Radio London's Duncan Johnson joins the Caroline crowd. 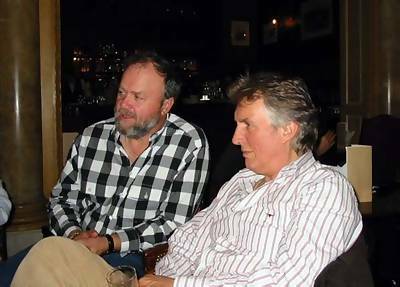 Keith Hampshire and Johnnie Walker.